For many of us who are striving to keep pace in today’s frenzied, fast-paced digitally driven lifestyle, it’s difficult to imagine living and working on a family farm that traces its history back hundreds of years. Waking up at dawn, tending to farm chores, and turning in early to ensure a restful night’s sleep are all part of life on the farm. Farmers also put a lot of blood, sweat, and tears into this labor of love; many bumps and bruises are earned along the way. Although there’s been a rise in the number of farmer’s markets and farm-to-table restaurants from the Hudson Valley to Manhattan and beyond, many people aren’t well attuned to the realities of farm life. 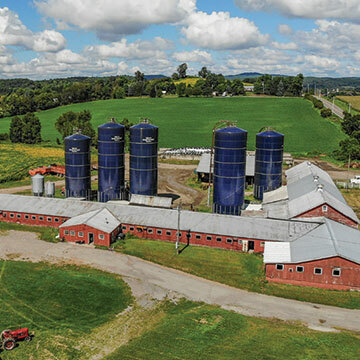 The land that the Millerhurst Farm sits on in Ancramdale, NY, dates back to 1770, but since 1887, several generations of Miller family descendants have toiled on the land. Beyond being a livelihood for brothers – Mike, Jim, Joe, and Tom and their wives –producing milk was a means of carrying on a family legacy. In 1770 Johannes Streibel purchased the farm, which was part of the original Livingston land grant. In 1785, he granted the 234-acre farm to his daughter Eve and her husband Henry Hoysradt as a wedding gift. The Miller boys’ great grandfather Harmon Miller married Annie Barton whose uncle was a Hoysradt. The farming lifestyle was directly passed on to the Miller sons through their grandfather Clifton Miller and their father Harold. “Our grandfather’s older brother Barton Miller had a prolific herd of registered Holstein cattle and our father became interested,” explains Mike Miller who runs the day-to-day operations of the farm. When he was just a schoolboy, Harold was already milking 40 cows. He and his lifelong friend Jack Pulver were introduced to opportunities to upgrade the genetics and raise superior cattle through the Pine Plains FFA’s agricultural education program. The farm’s first registered purebred cow hailed from Bos-Haven Farm in Verbank in 1947. By 1953, Harold graduated high school, and in ten years, he had a milking herd of nearly 100 registered cows. Throughout the years, Millerhurst Farm has enjoyed many successes. The Miller’s ancestors were once honored with the Century Farmer Award – the most prestigious in the state. In 1976, the farm was recognized as a National Bicentennial Farm. Beyond its award-winning cows, Millerhurst Farm benefitted from the sale of some of its prized cattle. The Millers pitched in to explain what farm life was like several decades ago when the Hudson Valley region was a prime area for desirable cattle. “In the 1970s, we were exporting heifers. The genetics of cows in this country were in demand all over the world. The Hudson Valley had some of the most desirable cattle and there’s very few of them left,” says Mike. Some of these sales resulted in exciting business trips, which turned into vacations – far away from the open fields of Ancramdale. During the 1980s, the $245,000 sale price of one cow whisked Joe and Tom off to California. “We were treated like kings. Here we were flying around in private planes – just a couple of country boys,” says Joe. At its peak in 2008, Millerhurst Farm sold 2.9 million pounds of milk and had approximately 100 milking cows. Then there are the personal connections the Millers have with their beloved animals, which prompts several family members to reminisce. “When James and I got married, the first Christmas gift I received as part of the family was a calf,” says Janice. The cow’s name was Fantasy, but Janice renamed her Oxy. Janice proudly mentions that Oxy went on to have nine or ten calves. Other family members chime in lovingly on the hazards of working with the cows and how they often unintentionally cause bodily harm to the farmers. “The farm is no place for the faint of heart. It’s tough on the body,” says Mike. “Mike is my father reincarnated. He knows cows and has a way with them. There’s not many people like that anymore,” adds Joe. “We could go on and on with cow stories. There was a depth of pedigree and the bloodlines carried on. There were cows here that went back to the origins of the breed. These were some of the greatest cows,” concludes Joe. On the evening of October 14 of this year, the Millerhurst Farm experienced a devastating blow to the family farm when a fast-moving fire swept through the barn. “I was here at the house and the power went out. I could see smoke and I raced over to the barn. At that point, I don’t even know what time it was. It’s really a blur,” says Emily, who along with husband Mike are the owners and operators of the farm. Photographer Michael Molinski was the first to report the fire. He was driving home from a photo shoot at around 7:30pm when he saw the barn ablaze – all lit up in flashes of orange. “Both my hired men (Victor and Mike) were down at the barn, but the smoke was incredible and we knew that there was no going in to save the cows,” reveals Emily. Beyond taking an emotional toll on the Miller family, the fire also made an impact on many of the local communities that dot the Hudson Valley. The fire claimed the lives of 46 precious cows and destroyed 16,000 square-feet of barn space, 1,000 bales of hay, a tractor, and feed mixer. “The cows are the hardest loss,” reveals Mike. The Millers explain that their cows were like children to them. Several members of the family described some of the animals and their unique personalities. Among the cows that perished were Gadget, who was the youngest at two years old and Stella, who belonged to a friend, Shannon Fletcher. She was nearly ten years old and was the oldest. Mike also fondly recalls a special calf, Arieal who was awarded First Place Spring Holstein Calf and was Junior Champion in 2015 at the Dutchess County Fair Youth Show. This year, she was awarded First Place in the Junior Three-Year-Old category at Rhinebeck’s Dutchess County Fair. The morning after the disaster, the family was happy to discover that one of the cows, Glow survived the blaze. The Millerhurst Farm currently has 70 cows remaining. At the time of the fire, some of them were outside while others were housed in another barn. Investigators later determined that an electrical malfunction in the wiring behind the milk-house panels is what sparked the fire. “Unfortunately it takes tragedy to unite family. We’ve all gone our own ways and have had our differences. It’s been a long time since this family sat together and reminisced as a family,” says Joe. In the wake of the fire, there was an outpouring of support from the community. Friends and neighbors joined local farms and businesses, and they all pitched in to assist in whatever way possible. While some cooked meals, others came by with coffee and pastries. Some pitched in to clean up the debris while others offered equipment, donated hay, or established fundraising campaigns and events. “There’s been a disconnect between rural and suburban people. The communities used to be so intertwined back in the heyday. This tragedy goes to show there’s still community, but we just don’t see it every day. When push comes to shove, they’re there for you. It’s like that with family and close friends. It’s like a snowball affect – everybody pitches in,” says Joe. The day of the fire, a meal train was started. Beyond feeding the family, the generous food supply also fed those who volunteered on the clean-up efforts. The Miller family was quick to praise the efforts of Ginocchio Electric in Ancram, NY. “By 2am, we had power back at the house. The electricians worked the whole next day to restore power,” says Mike. “Jake Meiller of JLM Excavating and his crew and Superior Sanitation’s crew worked non-stop for a week. They cleaned everything up and graded off what was left, so we didn’t have to look at this pile of crumpled steel and tin,” says Emily. Mike George Plumbing & Heating was quick to restore the water supply to the remaining calves and heifers. Farms2Tables organized a Millerhurst Farm Benefit Dinner, which was held on November 3 at Heermance Farm in Tivoli, NY. More than 40 local farms donated food and wine. Artist Todd Germann auctioned off paintings at the event. One hundred percent of self-serve coffee sales at the Pine Plains Platter in Pine Plains, NY, was also donated to the farm. The staff encouraged customers – and those who were not patrons – to stop by and leave a donation. Grogger’s Bar & Grill in Poughkeepsie, NY, organized a line dancing event, which was held on October 21, and exceeded the fundraising goal. A GoFundMe campaign was initiated by Susan Klein on behalf of the farm. Although unfamiliar with the family, Klein read about the fire via the Hudson Valley Farm Swap. She was inspired to launch the campaign because she believes in random acts of kindness and assisting those in need. Other fundraising initiatives included a chicken barbeque held at the Lion’s Club Pavilion in Pine Plains, NY, and an event at Stissing House, both on November 11. The Ancram Firehouse Company also hosted a fundraiser. The Miller family is very grateful to the community for its support. At press time, they were still adjusting to the situation and engaged in community fundraisers. “We’re going to take some time to look at other barns and options. We will research different types of dairy farming,” says Mike. The barn was 50 years old and now that it’s been destroyed, there’s an opportunity to modernize. Mike mentioned a mission to purchase new comfort mattresses for the cows. “This farm has seen hard times, through the depression, world wars, but you work at it because you love it. You take the good with the bad and you keep going,” concludes Joe. Although difficult and painful, the Miller family is looking ahead to rebuilding and celebrating the 250th anniversary in 2020.